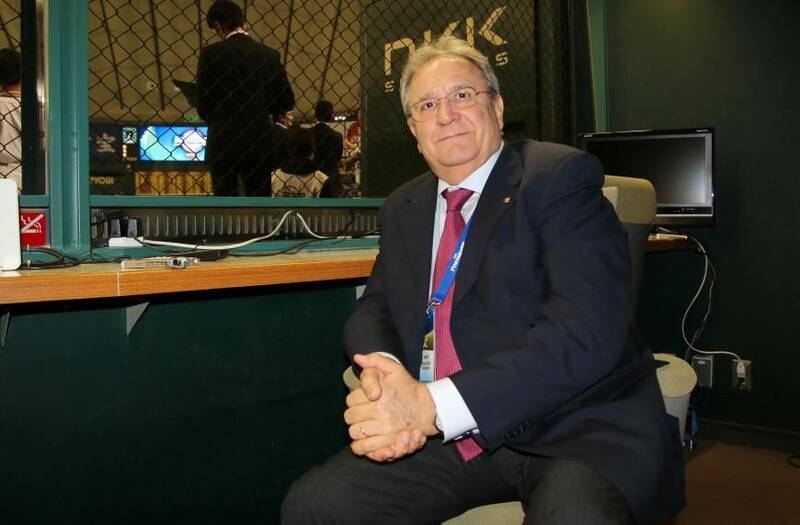 Riccardo Fraccari, the president of the World Baseball Softball Confederation, was in Sapporo for the Premier 12 opening game between Japan and South Korea on Nov. 8 before returning to Europe to attend an IOC summit in Lausanne. The Italian then traveled back to Japan for the final phase of his federation’s flagship baseball championship in Tokyo on Wednesday night. So Fraccari wasn’t able to see the first and quarterfinal rounds in Taiwan in person, but he’s pleased that the WBSC has had success and received favorable reviews during the inaugural event, which will close with the gold medal and third-place contests on Saturday. What’s more, Japan and Taiwan games have drawn high TV ratings, with tournament action trending on Twitter. “The feedback are very positive from the participating teams and fans,” Fraccari told The Japan Times at the Big Egg before Thursday’s Japan-South Korea seminal game. “In terms of the attendance and in terms of the success of the event, I’m very happy. Fraccari emphasized that the Premier 12, unlike other international baseball competitions such as the World Baseball Classic and World Cup, is not just an invitational tournament, but it’s also an event where the participants will be selected based on the world rankings. The rankings are based on the records of all national teams, including underage categories, and it makes it a truly legitimate world championship. But the Premier 12 is a new global baseball championship and the WBSC, which was established in 2013 by merging the International Baseball Federation and International Softball Federation, is committed to making it a better tournament going forward. Fraccari, who was elected as the WBSC president in May 2014, said that the confederation would “study the results of the this event” and would be flexible on altering the format. Part of the improvements would be the involvement of Major League Baseball and its players. For the inaugural tournament, players on MLB clubs’ 40-man rosters are not participating. Fraccari said that the WBSC might have to review the timing of the championship so any players, including the big-leaguers, would be able to participate in the Premier 12. “We have to make adjustments on the schedule to avoid any conflicts from MLB, NPB, the winter leagues,” Fraccari said. Meanwhile, Fraccari stressed that the roles of the Asian baseball federations and professional leagues significant to the development of the Premier 12 and promotion of the game. “We cannot think of the Premier 12 without the NPB,” Fraccari, a member of the SportAccord Council, said with a smile. Other Asian baseball-crazed nations like South Korea and Taiwan are equally important for the game’s expansion, Fraccari said. “NPB is the leader, but KBO and CPBL also prove how powerful baseball in Asia are,” he said. “With their support, I think this event can be more international. One of the WSBC’s objectives is to get baseball and softball back in the Olympic Games. Fraccari said that his organization will try to make that happen.